What is new from BASF is Status herbicide for corn, giving growers a new option in post-emergent broadleaf weed control. 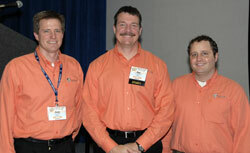 I interviewed all three guys to get the story on this new product from BASF. If you want to learn more about it they have a website dedicated to Status. BASF is setting a new standard for post-emergent broadleaf weed control in corn with Status herbicide. Growers were able to learn more about this new premier herbicide during the BASF What Is New session Friday at Commodity Classic. “Status offers growers a new level of confidence in their weed control by controlling a broad spectrum of weeds while offering them superior crop safety,” said Leon Duchene, Status Product Manager, BASF at the session. Gary Schmitz, Ph.D., Midwest Technical Service Manager for BASF, reviewed university trial results and use recommendations for Status herbicide. This included recommendations for conventional corn and Roundup Ready corn as well as the flexibility to be used in a sequential application or a total post treatment. I also learned that they are not wearing pink. The shirts are “man-salmon” colored. These interviews are part of the CommodityClassicCast podcast series.